Apart from its cricket, India is famous for so many things, with Agra's beautiful 17th-century Taj Mahal ranking amongst the world's most breathtaking landmarks and boasting spectacular Mughal architecture at its finest. India has also become known for its Bollywood film industry, its national politics, its spicy curries, its thriving IT industry and its many nation-wide call centres. The world's biggest democracy, India features a president and a prime minister, both of which are based in the capital city of New Delhi, where you will find the Parliament House (Sansad Bhavan) and many other national landmarks. New Delhi is also home to countless ancient shrines and temples, with the city's two main thoroughfares being the Janpath and the Rajpath, located between the India Gate and Presidential Palace. If you get to explore India, you will discover great cultural diversity and an ever-changing landscape, ranging from sandy deserts and plateaus, to the beautiful coastline around Mumbai, edged by the Arabian sea. 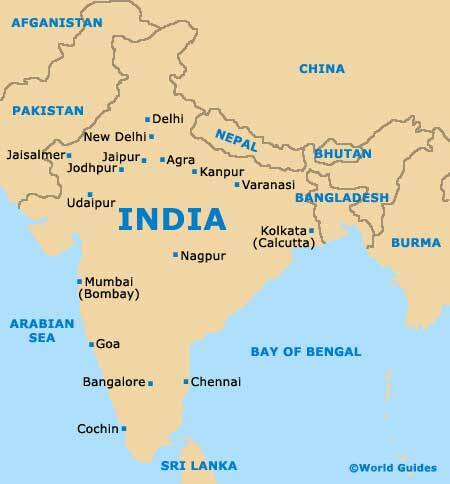 India's interesting terrain is the result of its variable climate. The northerly Himalayan area even feautures winter snow, compared to scorching temperatures and periods of monsoon in most lowland cities. Many visitors to India will enjoy the regional specialities on offer, with wheat and rice being the staple food of the country. Spicy food is popular all over India, together with many unusual, fragrant sweets. Whenever you visit India, look out for its colourful annual celebrations, of which Republic Day is especially noteworthy and celebrated throughout the country each January. Most tourists come to Agra for one sight and one sight alone, its world-famous, white-marble Taj Mahal. However, this breathtaking structure is just one of a number of historical temples, with the Agra Fort also being extremely notable. The progressive city that is Bangalore stands in the Karnataka state of India. It soon becomes apparent that Bangalore boasts a rather relaxed atmosphere. Much interest lies around the central Mahatma Gandhi Road (MG Road). Formerly named Madras and based within the Tamil Nadu state, Chennai enjoys a coastal situation, next to the Bay of Bengal. Away from the beaches, the Guindy National Park is a notable highlight for many visitors. With an exceptional selection of beaches and coastal sights to see, Goa lies alongside the Arabian Sea. Visitors tend to flock to the coastal resorts, where bamboo shacks on the actual beaches provide the ultimate in accommodation. Sited in eastern Rajasthan, on the northern side India, the city of Jaipur has much to offer. With hilltop fortresses, sumptuous royal palaces and beautiful pink-painted sandstone architecture, Jaipur is often referred to as the 'Pink City'. Known to many as simply the 'Golden City', Jaisalmer has many enticing qualities and enjoys a rather isolated setting next to the Thar Desert. Jaisalmer's fortress is of epic proportions and is comprised of almost 100 towering bastions. Affectionately known as the 'Blue City' and also the 'Sun City', Jodhpur is located within the Rajasthan state, where it is the second-biggest city. Tourists visiting Jodhpur will certainly find the elevated 15th-century Mehrangarh Fort hard to miss. Kolkata (previously Calcutta) ranks as one of the most interesting cities in India and its historic district boasts an array of colonial buildings. The ghats (stairways) along the Hooghly River form a centrepiece for local life. Previously known as Bombay, Mumbai is one Indian city quite unlike any other. Mumbai is an island city and lies next to the Arabian Sea, with a series of leading coastal resorts, which are plentiful around Girgaum Chowpatty and Juhu beaches. Situated within India's vast state of Delhi, the famous city of New Delhi is nothing short of a metropolis. New Delhi is filled with endless exciting smells and sounds, along with plenty of historical temples, shrines and other beautiful buildings. Udaipur is a particularly serene Indian city and brimming with romance. Tourism has arrived in Udaipur in recent years, with visitors coming to admire the magnificent marble temples scattered around the shoreline of Lake Pichola. Often referred to as the city of Lord Shiva, Varanasi is an especially religious Hindu city. The tremendous character enjoyed by Varanasi is provided in no small part by the meandering River Ganges (Ganga) and its riverside 'ghats'.